The innovative Root Assassin Garden Tool helps you Garden Easily. The combination Shovel and Saw is a unique new way to slice through tree and plant Roots with ease. The Patented "Teeth" of the Root Assassin let you transplant and clear overgrown areas with just one tool. You can even use the Root Assassin for trimming trees and digging trenches. Root Assassin "Teeth" can be sharpened each season with a standard file or grinder, as needed. DIGGING AT ITS BEST - The Root Assassin Shovel/Saw will do the job in half the time it would take with ordinary tools. Our unique shovel includes a metallurgically enhanced "bone structure" and curved tip that is perfect for cutting through roots and weeds. Because it has alternatingly-beveled teeth in opposite directions on both sides of the head, it can cut roots when going in and coming out. NOT AN ORDINARY GARDENING TOOL - Most other shovels on the market scoop small amounts of dirt and aren't quite able to cut through roots and other tough materials. This causes back problems and wastes your time on projects that should be quick and easy. Switch to the Root Assassin Shovel/Saw and you'll see an astounding difference. No need to bother your husband to do the heavy digging on weekends! STURDY HANDLE - Shovel handles often dig into your hands, whether they are plastic or wood. 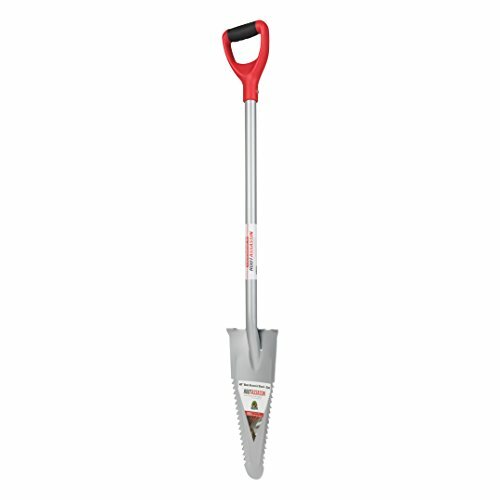 Our expertly-designed shovel handle is durable and has a metal handle that is rubber coated and bright red for comfort. It isn't prone to chipping and rusting like your average shovel handle. It also has a solid structural carbon steel blade and 16 serrated teeth on each side of the shovelhead. MORE POWER - The Root Assassin Shovel/Saw is the original root shovel. Others are knock-offs. Its serrated, double-sided head cuts through roots and other tough materials with ease and can be sharpened with a wheel or grinder. The pointed tip enables the user to dig deep under the tree or bush for maximum leverage. It also enable a longer stroke when using the tool as a saw for tree limbs. ROOT ASSASSIN QUALITY PROMISE - At Root Assassin, we believe in quality without compromise. You should be able to trust your tools completely when using them for important projects. We make products that meet the highest level of excellence to keep our customers happy and safe. Need a storage solution? The shovel/saw fits well in our garden tool holder! We include a lifetime replacement guarantee. If you have any questions about this product by Root Assassin, contact us by completing and submitting the form below. If you are looking for a specif part number, please include it with your message.